There are lots of reasons to start to invest in a kayak; whether in search of solitude and contemplation out in the open ocean, or adrenalin-fuelled thrills in the white-water rapids of a wild river, kayaking provides excitement and adventure. But for the beginner there are some necessary considerations to take before diving straight in. One of the functional priorities of their kayak is likely to be its portability. Being a beginner means you’re unlikely to have yet invested in a cumbersome kayak rack or holder, nor do you have the experience to care for a weight and potentially very expensive pro kayak. At this point, you might not even know what sort of kayaking you intend on doing. So first, we’ll discuss the benefits of a lightweight kayak before we move on to choosing the right size for you. 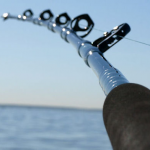 The benefits of a lightweight kayak are numerous. A lower weight means greater ease when transporting the kayak from sun-drenched sea to gentle river. But not all lightweight kayaks are born equal; dependent upon the material they’re constructed from or the environment they’re intended for, some will be more or less easy to move around. Inflatables offer great portability. They can be folded and wrapped up when not in use, and are light on account of the PVC or woven fabrics they’re made from. Modular kayaks are another option for high portability. They snap apart to fit into your car but are also solid in the water. But perhaps the biggest benefit of a lightweight is that they’re generally built from quality materials. Unlike heavy old PVC, lightweights can be composite or fiberglass. Though higher in price, these materials are stronger, more flexible and can be repaired. They offer a better service and therefore a better experience for you. Choosing the right size kayak for your needs can sometimes be a tricky business. After all, the size of the kayak will have an effect on its performance – how fast it will run, how it tracks (meaning how easily you can paddle in a straight line), or how much of a load it can handle. But knowing your needs is a sure-fire way to know what size you’ll need. So before bringing out the wallet or handing over your card, ask yourself what exactly you want from your soon-to-be best buy. The size of a kayak depends on what it was built to do, so choosing the right size is really about asking the question of what and where you’ll be going and doing. We’ll take a look at some of the major classes and sizes of kayaks to best inform the beginner before buying. White-water kayaks are 2short – usually between 4 and 10 feet in length, wide – from 22 to 27 inches, and have a lot of rocker (the degree of curvature of the kayak’s hull). These factors enable the white-water kayak to perform like a well-honed predator in a fast flowing river; its short length makes it nimble and quick to turn while its high rocker helps the boat pop back to surface after running a rapid. Just like a leopard, it excels over short, volatile bursts and is the best-equipped out of all kayaks for this job. But this doesn’t mean you’d want a leopard to run a marathon. In the rapids the white-water kayak is given a push: the river is its engine. But on flat, open bodies of water its small size means it’s slow, cumbersome, and potentially dangerous to use in the sea. Strengths in one environment become weaknesses in another. So unless you’ll be hitting the rapids overtime you venture out, the short white-water kayak isn’t for you. Stepping up a size brings us to a classic class for the kayaking novice: the recreational kayak. The recreational is ideal for those not yet ready to deal with a rolling ocean or trips that last for days, but provides a good option for those who want the confidence that comes with a stable boat where speed is not a priority. Only a few feet longer and marginally narrower than the white-water class, they’re not built to hit high knots. Between 10 – 12 feet long the recreational is easy to use, though not overly sensitive, and provides enough storage for a day trip. A good option for those starting out but not for use in strong currents or heavy seas. Adding a further couple of feet in length brings us to the traditional stomping ground of the touring kayak. At this point, we’re moving towards boats that are suitable for longer day trips. The owner of a touring kayak is no longer happy with a half-hour paddle close to the shore, but demands open water and wilderness. And that is what the touring kayak is for. Usually from 12 – 17 feet in length, they have improved tracking due to their slimmer hull that commonly comes with a rudder or skeg – a retractable alternative to the rudder. They also have bulkheads for more storage and improved buoyancy. The tourers are for novices who have some experience. Finishing our lowdown on sizes is the sea kayak. The longest of our boats at 16 – 19 feet, the sea kayak are designed for, as you might have guessed, use on the open seas. They lie low in the water and have minimal rocker, as well as a rudder or skeg, meaning their tracking ability is second-to-none and ideally suited for long journeys. More often than not, they’ll be equipped with bulkheads and small hatches for storing gear and providing buoyancy. Some will also offer water pumps to help the budding kayaker to rid their craft of excess water. Great for choppier waves or long, demanding trips, the sea kayak is a more expensive craft and requires some experience before it will be fully mastered. One other factor worth considering is your own size and weight. As a rule of thumb for beginners, small people will fare better with shorter kayaks. Shorter boats are usually easier to manoeuvre and require less strength to steer. So, whatever style you opt for, if you’re on the smaller side of life, a good option would be to buy a kayak towards the shorter end of their scale. Here’s a list of 8 kayaks that we think would make a great buy. All high in quality and offering something a little different to the rest, the list is from cheapest to most expensive. 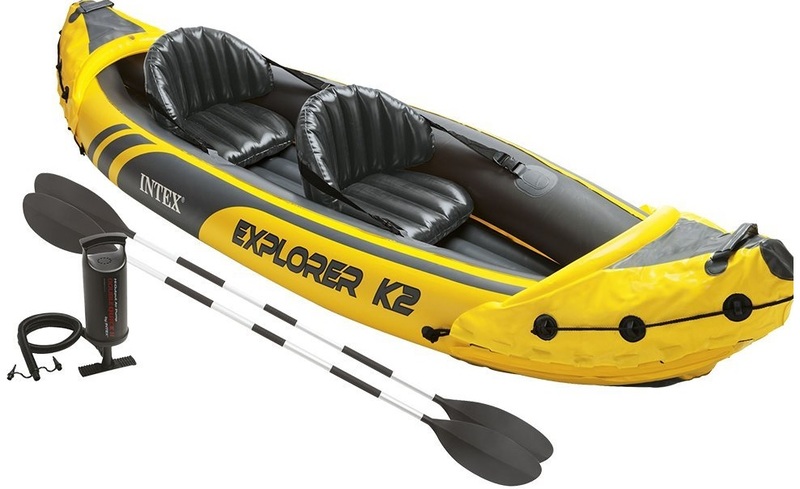 The Intex Explorer K2 is an inflatable that was mentioned earlier in this article. A two-person kayak intended for still lakes and flat rivers, the K2 is a great option for beginners wanting nothing more than a gentle afternoon paddle and are not to part with a lot of cash. This kayak includes a removable skeg for improved tracking ability and a U.S. Coast Guard I.D. It’s brightly colored for extra safety and is one of the lightest kayaks in the list. It’s also the cheapest. The ‘sit-on top’ means there isn’t a cockpit to sink into. This can be ideal for beginners who are just starting out on their kayaking life. The Sun Dolphin is made from a high density polyethylene to ensure a light weight with a durable core. Short and wide, this craft is designed to build confidence in the beginner by offering great stability. The sole white water raft on our list really emphasises the notion that the best things come in small packages. Short and thick, the Emotion Glide is nimble and quick for running some fast flowing waters. Built from a strong high density plastic, and coming with bow and stern rigging to secure your gear, this kayak is guaranteed for 5 years. While it isn’t intended for the most extreme rapids, the Emotion Glide is nevertheless a great entry level white water kayak at a reasonable price. This modular kayak is a sweet compromise between solid construction and light weight. The Tequila GTX can snap apart and be reassembled quickly meaning it will fit in the back of a car easily but you’ll still be assured of safety on the water. It features a uniquely shaped keel to track easily and still be stable enough for the novice. A sound choice for who want an easily transported kayak that’s hardier than an inflatable. The Edge 14.5 is a good all-rounder that packs some high-end features, like its custom-fit seating system, into a really reasonable price. The Edge is certainly not the lightest in its class, but making up this weight is the durable rotomolded plastic body. An alternative model, made from thermoformed ABS plastic, is lighter but comes with a heavier price tag. This really is a unique craft. At first you might think the Bay Kayak is just a giant piece of origami, but fear not, this 12 footer is the real deal. Designed to be transported in a car and unfolded upon reaching your destination, it assures maximum portability at a great weight. This folding kayak is guaranteed for over 20,000 folds, and is equipped with a reinforced cockpit and bulkheads to add strength to its body while on the water. That said, the Bay isn’t designed for heavy waters; it is best for the open lake. The Eddyline Skylark Kayak is one of the more recent ‘cross-over’ kayak types that attempts to bind both quality performance of slim, high-end sea kayaks with a more comfortable recreational size design. A fine choice for those beginners are looking for more from their craft but not quite yet ready for a full bodied sea kayak, the Skylark is light and reasonably long. With the word ‘revolution’ in its name, the Mirage Revolution promises a new dawn for multipurpose kayaks. This kayak is built like a tank and not for the faint-hearted. The manufacturer, Hobie, claims that versatility is the name of the game for their model which offers both speed and manoeuvrability by forgoing the traditional paddle for the modern “paddling system” that allows the user to paddle with their feet rather than arms. The intention is for the kayaker to be able to fish or shoot photos. The Mirage Revolution is wide offers some stability and is jam packed with accessories like its retractable rudder. All of these details combine to make this beauty the most expensive kayak on this list. Now you can choose you first kayak and start to derive pleasure from new feelings.